This newsletter was originally published on June 23, 2017. A report released this week by Advanced Energy Economy (AEE) and the American Wind Energy Association (AWEA) finds that market forces – primarily low-cost natural gas and flat demand for electricity – are the forces driving some coal and nuclear plant to retire, and not state and federal policies supporting renewable energy development. The report further concludes that the changing electricity resource mix poses no threat to the reliability of the nation’s power system. The report addresses a number of the issues raised two months ago by Energy Secretary Rick Perry about the implications of retiring so-called “baseload power” plants. The report, which was conducted by the Analysis Group, argues that the term “baseload resources” is outdated and no longer reflects the realities of today’s electric system, which depends upon a wide variety of generation and demand-side resources to ensure essential reliability. The report further argues that many advanced energy technologies can and do provide reliability benefits by increasing the diversity of the system, and that gas-fired resources and renewable capacity together provide both around-the-clock power and the flexibility to cycle and ramp as needed to meet and sustain bulk power system reliability objectives. New regulatory changes may lead to more distributed generation owned by independent producers. The Legislature is considering a more competitive open market for retail energy. The House Energy Policy Committee approved bills to expand the number of companies using eminent domain for transmission line siting. Southfield joined other Michigan cities in committing to the Paris climate agreement. Midwest businesses are continuing to invest in advanced energy, despite mixed political signals. Girard Township will hold public hearings on a proposal by Michigan EIBC member company Cypress Creek Renewables to lease 20 acres of township cemetery land for a solar farm. Residential solar installations are continuing to grow Up North. The Kalamazoo Nature Center celebrated the solstice by unveiling a new solar array. Michigan regulators approved a plan for Consumers Energy to begin construction on a wind project three years early. The debate over wind energy has not let up in Tuscola Township. Ann Arbor officials hired a firm to do an energy audit on city-owned buildings in hopes of identifying new ways to save. A battery manufacturing company is opening a research and development center in southeast Michigan. The Michigan Energy Agency is projecting a reliable electricity supply. Members of Ontonagon County Rural Electrification Association, a cooperatively owned power company in the UP, claim the board is blocking their input and not being transparent. West Michigan environmental groups are pushing to replace diesel buses with electric buses. Ann Arbor is planning to purchase electric vehicles for its city-owned fleet and charge them with solar energy. Lansing got a visit from an electric school bus. The American Center for Mobility plans to have the first phase of its automated vehicle proving ground open for testing by December. The University of Michigan will introduce two driverless shuttles this fall, which will carry students on a two-mile loop on campus roads alongside regular traffic. The U.S. Court of Appeals for D.C. upheld FERC’s approval of the PJM Interconnection’s new electricity market rules, which several energy groups have complained will have an adverse effect on wind and solar providers. Sources said former George W. Bush administration official Jeff Holmstead will be considered for the No. 2 Environmental Protection Agency position. The Department of Energy will eliminate its Office of International Climate and Technology, which works with other countries to develop advanced energy technology. Democratic legislators are calling for a national green bank to fund local advanced energy investments. There’s a new app to help corporate purchasers evaluate advanced energy projects. Bloomberg is taking steps to increase green bond accountability, as the global market for green bonds doubles from $48 billion in 2015 to $95 billion in 2016. Approximately one-third of the country’s solar workforce is at stake with Suniva’s petition to impose tariffs on imported solar cells, according to estimates by the Solar Energy Industries Association. University of Missouri students are researching lighter, more portable and cheaper solar cells. Virginia has more jobs in the solar industry than the coal industry for the first time ever. Florida’s governor signed legislation implementing tax breaks for solar. A high school in Ohio is trying to supply 80 percent of its electricity through a new solar installation. A 12,000-square-foot industrial building near Chicago is getting a 1.2-megawatt solar installation on the roof. Duke Energy utilities are facing accusations of stalling grid connections for solar projects. President Trump’s proposed solar border wall could pay for itself. Analysts consider what caused California’s first quarter solar downturn and what its implications are. Federal regulators are refusing to kill a transmission fee that over-inflates the cost of wind energy. Opponents to wind energy are planning public forums in South Dakota before a referendum vote next month on setback distances. Atlantic coast states are competing to become the capital of America’s up-and-coming offshore wind industry. Texas’s thriving wind industry is threatening natural gas plants. Oil prices are stuck near 2017 lows. According to the U.S. Energy Information Agency, coal is still the dominant generation fuel in the Midwest. South Dakota regulators approved plans by Xcel Energy to increase rates for efficiency projects. Obama-era Energy Secretary Ernest Moniz launched a new research nonprofit, which will release a report about America’s electricity grid. An 18-mile stretch of I-85 in Georgia may become the world’s first sustainable road that generates its own energy. Counties in the Twin Cities region of Minnesota are voting to set their own taxes to fund advanced transportation projects. Sources say the EPA will propose renewable fuel requirements for 2018 soon. Robert Bosch is planning a $1.1 billion plant in Dresden, Germany to produce components for driverless cars, the single biggest investment in the auto parts supplier’s history. Join Groundwork Center and the Great Lakes Renewable Energy Association at Northwestern Michigan College June 23-25 in Traverse City for a conference designed to mobilize clean energy investments in homes, businesses, and communities. The conference includes a free film screening, panel discussions, keynote speakers, and a fair. For more information, click here. The 2017 CHP Conference is taking place Wednesday, June 28 in Grand Rapids. This year’s conference is focused on the food processing, health care, and higher education sectors, and includes a primer on CHP technology and its applications; sector-specific case studies, showing how companies and institutions save money on energy costs by installing CHP systems; information on available technical resources and financing options; and a lunchtime update on the Michigan CHP Roadmap currently being developed for the Michigan Energy Office. Registration for this event has closed. The Energy Alliance Group of Michigan is hosting a program entitled “PACE in West Michigan – Making Building Efficiency Upgrades Affordable” on July 12 in Grand Rapids. Property Assessed Clean Energy (PACE) financing is now available in the City of Wyoming, and is under consideration in the cities of Grand Rapids, Walker, Grandville, East Grand Rapids and Kentwood. This event will provide information detailing how to use this new financing option for upgrading the energy efficiency of commercial, industrial, multi-family and non-profit buildings. For more information or to RSVP, click here. The 2017 PlugVolt Battery Seminar is scheduled for July 18-20 in Ann Arbor. Industry leaders, policy decision-makers, and key stakeholders from more than 80 companies are expected to gather at the PlugVolt Battery Seminar to learn more about the challengers and opportunities for energy storage systems in grid/utility storage and automotive applications. Register here. The 1st Annual Sustainable Detroit Forum is scheduled for October 25. The event will consist of interactive learning, keynotes, and short presentations. Acoustic musicians will perform during breaks. Proposals for presentations will be accepted for Sustainable Projects, Personal Green Stories, and Lessons Learned/Greatest Failures. Proposals are due July 14. Greentech Media’s Grid Edge World Forum 2017 will be held in San Jose, CA on June 27-29. As the only conference exclusively focused on emerging distributed energy system, this event highlights the trends, opportunities, and innovation happening at the grid edge. 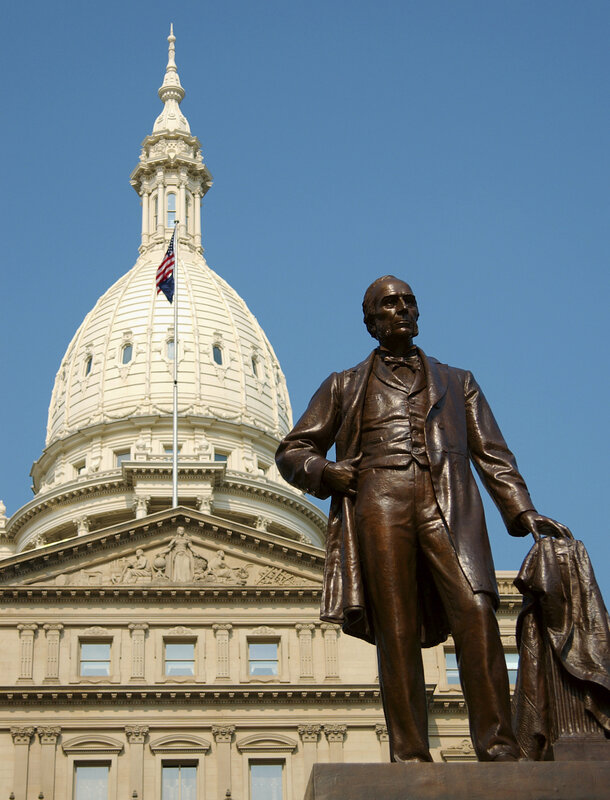 A web site from the Michigan Public Service Commission provides details on the laws, which took effect on April 20. For more information, or to sign up for notifications, visit www.michigan.gov/energylegislation. Google’s free online tool, Project Sunroof, now shows which homes have already installed rooftop solar panels. Michigan EIBC member company 5 Lakes Energy has a new blog. Read the first post here.